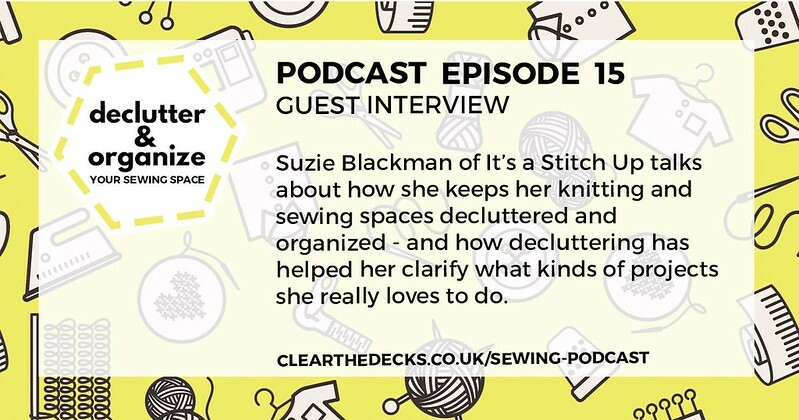 Nadia Arbach of Clear the Decks invited me to appear as a guest on the podcast, having had a really positive experience following her process, and of course I jumped at the chance (any excuse to whitter on about yarn for half an hour!). I talk about how my recent decluttering experienced helped me regain creative focus. I share a few tricks that help me keep my knitting organised, and talk about some of the challenges I’m still working on around my sewing space and materials. 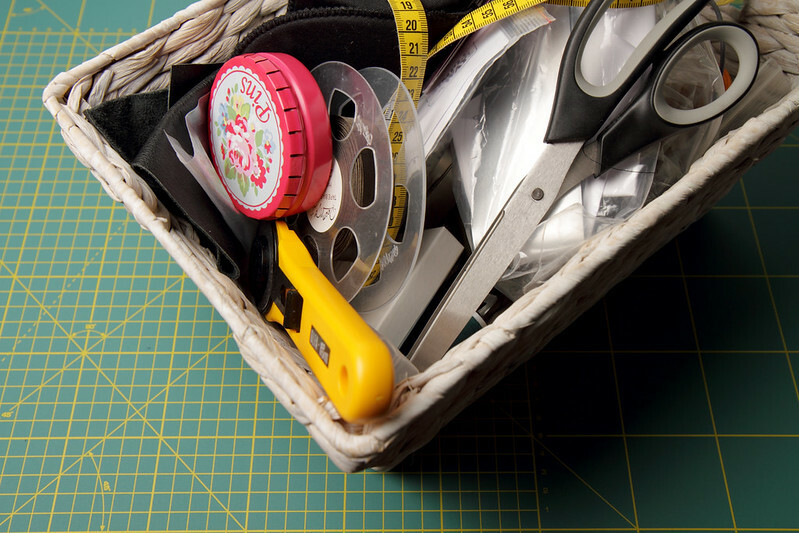 I took part in some early research for Declutter and Organise your Sewing Space (part podcast, part free online course), and was immediately spurred into action. I decided to embark on a journey (and it is definitely a journey, rather than something to do once and then move on) to let go of some of the clutter, both mental and physical, in order to improve my creative processes. My initial decluttering endeavours back in March resulted in me changing the way I think about my projects, tools and materials and led me to be much more productive, and even inspired me to start sewing again. Since then I have been avidly following the podcast, which takes a deep (and sometimes uncomfortable) dive into the complex mindset issues that cause clutter, and how to overcome them. By the way – if you’re not a sewist don’t be put off! While the examples Nadia gives along the way often relate to sewing clutter they definitely apply to knitting also, and probably any creative hobby for that matter. I consider myself to be a very organised person in my professional life – I spent many years organising teams’ workload and planning and delivering complex technical projects. When it comes to organising ‘things’ it’s a different story! This doesn’t come naturally to me at all, in fact I am a clutter magnet. Running It’s a Stitch Up has forced me to take control of many ‘things’ – at any time I have a stock of around 150 different yarn lines/shades, our dyeing kits require almost 20 different components, and we use almost 30 types of packaging – that’s a lot of stuff! I pride myself on exceeding expectations when it comes to getting orders shipped quickly (often the same day), and that requires slick organisation. Does the old phrase ‘out of sight, out of mind’ resonate with you when you think about your stash? It does me me and we’re not alone. According to Nadia this mindset often contributes to feeling reluctant to put stuff away for fear of forgetting what you have. Why? Because I can get an awful lot into a small space like this. It’s all ordered into compartments by weight, and further sorted by blend/style into large gripseal bags, allowing me to find the skein I’m looking for in seconds. With me unable to see what’s in my stash, Ravelry’s stash feature has become an essential tool for me. It enables me to view all my yarn in one place, filter by colour, weight, blend, brand, yardage and even my own tags – things that would be impossible (or very time consuming) with the physical yarn – helping me to choose the perfect yarn for my project. Have a look! Managing my online stash requires discipline, in that everything I acquire has to be photographed and quickly (well, after the necessary fondling) put away in the right place. For me, this is a small price to pay for the benefits of being able to view, search and filter from anywhere with an internet connection. In the podcast, Nadia and I talk Ravelry‘s many virtues for yarn-loving folk, and how it’s a great shame that there isn’t an equivalent for sewists. But we were WRONG! Recently launched Textillia aims to fill that gap, and I have already started using it to organise my fabric stash, patterns, projects and queue. It’s in the early stages so you’ll need to be patient when it doesn’t work as smoothly as you expect, but the creators are regularly making improvements and seem very open to feedback. If one of the things holding you back is that you don’t have a dedicated creative space to organise, again, you’re not alone! Even Nadia doesn’t have a dedicated sewing space. Early on in the series she talks about how the beautifully organised spaces you see in Pinterest are not realistic (or even real). If you’re struggling with the need to keep your work surface clear because it’s used for another purpose, then think about whether you can use vertical space (i.e. your walls). 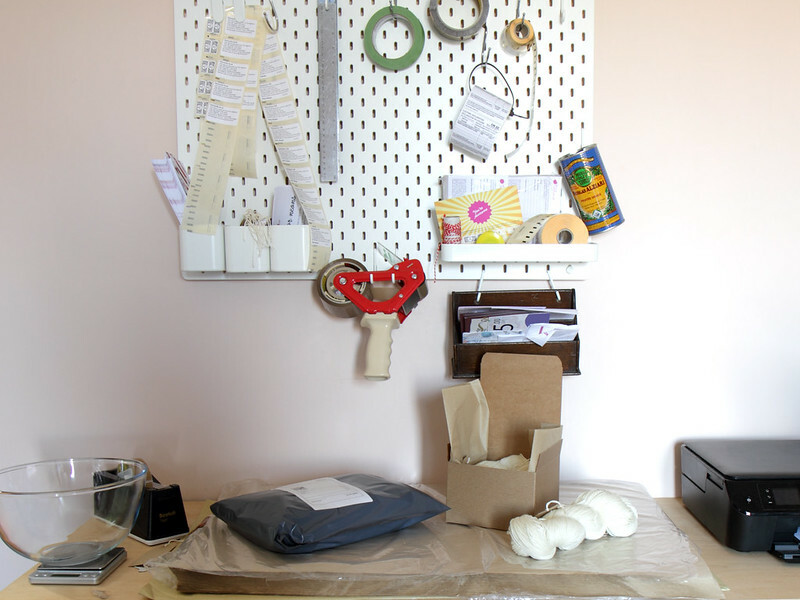 My packing station – this is where those parcels of joy get put together! IKEA’s ‘SKÅDIS’ pegboards have been a game-changer! It started with one one I got for the studio, to keep my scissors, lab spoons, gloves etc off my work surface in order to be able to wipe up easily. Not long after I had ordered one for my packing equipment (above). Now I have everything I need to pack orders within arms reach and a clear area for wrapping. Prior to this, my tape gun as always getting stuck to things, my labels were on the other side of the room, my scales had to go on the floor and everything took twice as long. I’m pretty sure I’ll get another pegboard for my sewing area soon. It would be great to have my scissors, chalk etc within reach without them being on the table. My own sewing space is also a multifunctional space as it doubles as my photography studio, which I use daily, so it has to be clear. The main thing that made sewing possible at all was swapping my cumbersome photography table lamps for an LED panel on a wall-mounted arm, thus freeing up table space. Decluttering doesn’t just mean getting rid of things, it can help to think about using your space in different ways. So, if you use a task lamp for example, why not wall mount it? This is a tip I picked up in Episode 13, which covers ‘disorganised thinking’. 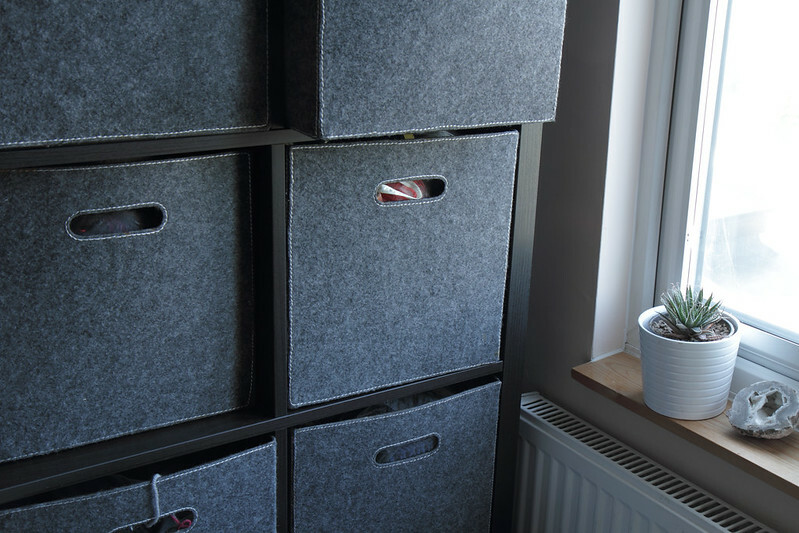 Nadia suggests a simple, but effective solution for keeping your projects organised: Allocate a box to each one and put in it all the materials you need for each. I was mentally struggling to keep track of my planned sewing projects, and also struggling to keep the bits for my current sewing project together when I needed to clear the space. I also felt like I was getting ahead of myself, and in my newly rejuvenated excitement for sewing I was being tempted by more fabric that I’d be able to use. Off to my local hardware store I went and I found a huge selection of stacking boxes perfect for the job, from around £2 each. Nadia recommends limiting your active projects to 3-5, and also being realistic about how much you’re likely to achieve when thinking about your planned projects. I decided, since sewing is not my main activity, to keep to one active project only, and a queue of two planned projects. 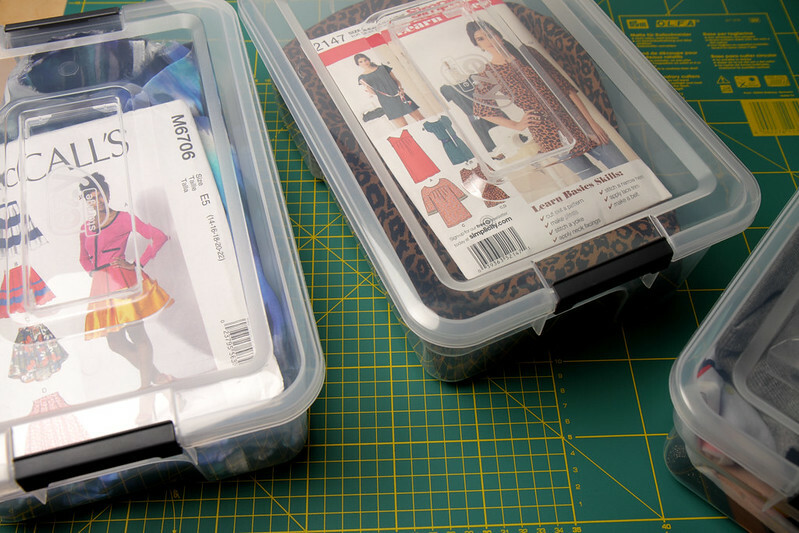 In each box I have all the materials for that project – fabric, patterns, thread and fastenings. I really like this method! Not only does it help me keep my current project organised, but having a physical queue really helps me to focus on what I want to do next, and make sure I have everything ready so I’m not wasting any time when I get a brief moment to sew. [That reminds me, I must order the zip I need for that skirt!] It also makes my planned projects feel more tangible and helps me resist temptation for new fabrics. This is another great tip from the series for those that don’t have a dedicated creative space, and maybe have materials in different places around your home, is to group similar materials and tools together. I love baskets for those bits and pieces that don’t have a proper home. I keep my sewing tools in a couple of baskets, so even though they live in my study rather than my sewing space, I can quickly grab them when I need to use them. Baskets are easy to stow on a shelf or in a cupboard when not in use, and save me from that “where did I put my 10mm elastic?” frustration. I was so glad to that this issue came up in Episode 14 – Listener Q&A, as it was something I touched on in the interview as often being a barrier for me in getting rid of stuff I don’t need. Putting things that are potentially useful into landfill is the worse case scenario for me, and Nadia has some great suggestions for how to dispose of unwanted items sustainably. Nadia does stress that it’s best to treat unwanted items as a ‘sunk cost’, because the time you’ll need to invest in recouping any of that cost is often worth more then its value. My LYS Wild and Woolly runs a brilliant initiative to rehome unwanted yarn and get a little bit of money for it (I’ve managed to buy myself a couple of books with my earnings). It’s worth checking any shops run a similar scheme in your area. Ravelry gives you the opportunity to mark your stash items for “sale or trade”, which lets other Ravellers know you’re willing to sell them. I have sold a great deal of yarn this way, even partial balls, which lots of knitters search for if they run short on a project. If you want to do this, you’ll do best if you take good photos, decide on a price upfront and be patient! It can take months, or years before a buyer comes along. There are destash groups you can post in to speed things up. I’ve found Freecycle to be a really quick and easy way to rehome all kinds of random equipment and bundles of small items locally. You won’t get any money but you will get a warm, fuzzy feeling from having helped someone out locally. If you’re destashing yarn, maybe you have a friend making a Beekeeper’s Quilt or a similar scrappy knitting project? (Our Stashbuster Cushion and Cerys Hexagon Blanket are great for this). I’m sure they’ll appreciate your yarn leftovers. The main reason I built up mental and physical clutter over time is forgetting to review my stash, my queue and my space. Over the 10 years I’ve been knitting (and approaching 30 sewing!) my tastes, interests, priorities and circumstances have changed considerably. I have kept materials I no longer love, and project ideas I am no longer excited about. Over time, these things can build up and weight one down, sapping creative energy. If change one thing, make it to go through your stash items and project queue regularly and consider whether you’re still excited about them. If the answer is no, they’ve got to go!